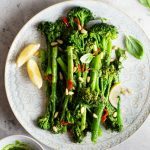 Tender sauteed broccolini tossed with homemade pesto, crunchy pine nuts, and fiery chilli. This is a side dish that goes with anything from roast meats to fish or simply eaten as it is as a light lunch. It's so simple yet full of flavour! Bring a pot of salted water to a boil and parboil the broccolini for 5 minutes, drain. Heat olive oil in a large pan (big enough to add the broccolini without it being over crowded) and add chopped garlic and fresh chilli. Saute for 30 seconds then add the broccolini with a sprinkling of salt to season. Saute the broccolini, stirring every now and then until cooked through and slightly golden (up to 10 minutes). Once cooked add the pesto and toss, serve on a platter topped with pine nuts. The cooking time depends on how much you have in the pan and how crowded it is. If the pan is overcrowded the broccolini won't cook evenly so make sure you have a pan large enough. This recipe takes around 10 minutes to saute but to check that the broccolini is done try inserting a sharp knife into the thickest part of the stock. If it goes in easily the broccolini is done. Alternatively simply cut a piece and taste it to make sure it's to your liking, it should still have a bite to it.